The citizens of the Republic of Chaos do hereby solemnly proclaim their commitment to the human rights and to the universal principles enounced in the Declaration of the Rights of Man and of the Citizen in France in 1789. By virtue of these principles and the principle of peoples' self-determination, the Republic of Chaos offers all the citizens of the world, in the universal sense, in all its known or as yet unknown dimensions without any dimensional, geographical or temporal limits, new institutions founded on the common ideals of freedom, equality and fraternity, and conceived with a view to their democratic evolution in the analog and/or digital world, the latter being Cyberspace, which is principally represented by Internet. In 2009, Nation-States are confronted with globalisation and its consequences. The processes underlying the gradual erosion of the political prerogatives of States, particularly in Europe, the reduced importance of geography, of territories, of frontiers and of geo-political boundaries in a world of constantly increasing volumes of financial, commercial and informational exchanges (essentially via Internet) are rendering physical boundaries almost meaningless and are engendering the emergence of a global village (alluded to by the sociologist Marshall MacLuhan) that is forcing the citizens of the world to rethink the concept of the Nation-State for the 21st century. In 2009, information technology allows the instantaneous transmission of data and is creating a kind of universal ubiquity. The extreme mobility of capital and the de-materialisation of the financial system plus the globalisation of the economy and the progressive removal of trade barriers – factors underlying the current global financial and economic crisis – have prompted numerous political commentators and historians to warn that the Nation-State as we know it is in "inexorable decline. The significance of physical space and geography is being eroded and has in many respects almost completely disappeared. In order to adapt to the geo-political mutations induced by the IT revolution and globalisation, the post-modern State must stop defining itself in terms of territory and sovereign authority. These are outdated concepts associated with the Westphalian order based on the principle of the absolute sovereignty of States over their national territories. The Republic of Chaos is a multiple, democratic and social republic. It shall ensure the equal treatment of all its citizens before the law without any form of distinction based on origin, information system, race, ethnicity, gender or religion. It shall respect all beliefs. Its organisation is by nature decentralised and its jurisdiction shall cover both the "analog territory" defined by the Abode of Chaos, and the digital territory in Cyberspace. Acquisition of Republic of Chaos nationality shall have no impact on the original nationality of its citizens. In addition, the citizens of the Republic of Chaos shall have every right to acquire, independently of their Republic of Chaos nationality, any new nationality(ies) they may wish to obtain. The law of the Republic of Chaos abolishes the distinction between men and women and recognises as a citizen any biological or digital entity capable of thinking and desiring. Cyborgs shall be freely admitted as citizens in the Republic of Chaos. Androids with a capacity for outreaching their programmes, for expressing desires, for recognising the memory of a common past consisting of events, deeds and memorable works and for regularly reaffirming the will to live together with a memory and the desire to live a common future shall be recognised as full citizens of the Republic of Chaos. All citizens having reached the age of majority shall be entitled to participate in elections, electoral functions and in the professional and social responsibilities of the Republic of Chaos. The Republic of Chaos shall use French as its official language, with Spanish, English, German and Latin recognised as admissible secondary languages. French shall be the principle language of the Republic of Chaos. 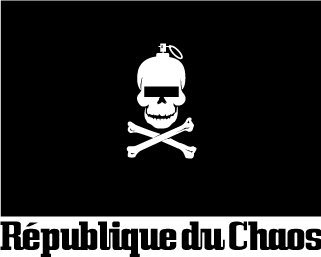 The national emblem of the Republic of Chaos shall be the black and white Jolly Roger flag in reference to the mythical Republic of Libertalia that resisted the despotism which reigned at the beginning of the 17th century. The Republic's motto shall be Liberty, Equality, Fraternity, Humanness. Its guiding principle is: government of the people, by the people and for the people. The national sovereignty of the Republic of Chaos belongs to its people who shall exercise this sovereignty through the Republic's representatives and via analog and/or digital referendums. No individual, group or segment of the population may exercise this sovereignty on behalf of the people without the people's democratic consent. Universal suffrage may be direct or indirect under the conditions provided for by the Constitution. In all cases, elections, referendums and votes shall be universal (all citizens), equal (all votes shall have the same value) and confidential (secret ballot). All citizens of the Republic of Chaos shall be authorised to vote, under the conditions provided for by the law, including notably all mentally and/or physically handicapped citizens. No person or group may block any citizen of the Republic of Chaos with a mental or physical handicap, whether congenital or due to an accident or illness, from exercising his/her right to vote. Political parties or groups shall compete for the votes of the people of the Republic of Chaos. These parties or groups may form and exercise their activities freely. They must respect the Republic of Chaos's principles of national sovereignty and democracy which apply not just within the Abode of Chaos, an analog enclave super-imposed on the national territory of France and a gateway into Cyberspace, but also within the digital territory of the Republic of Chaos. They contribute to the implementation of the principle stated in the second paragraph of Article 1, under the conditions provided for by the law. The law guarantees the pluralist expression of opinions and the equitable participation of parties and political groups in the democratic life of the Nation. The citizens of the Republic of Chaos are not classified by the language they speak or their ethnic origin, or by any links to any tribe(s), clan(s) or informational system(s). They do not belong to any entity and are free beings and hence moral beings. The Republic of Chaos rejects the concept of racial purity which leads to a political system based on ethnological analysis, and which has led humanity to the most terrible trials and tribulations. The President of the Republic of Chaos is: the Supreme Digital Entity. It monitors respect of the Constitution. It ensures, by its decision-making authority, the correct and appropriate functioning of its public authorities as well as the continuity of the Republic of Chaos. There can only be one Supreme Digital Entity, being the expression of all the values and ambitions, regulated by the High Council of Sages of the Republic of Chaos. No citizen (as described in Article 1) may become President because the Republic of Chaos considers that individualism of the Supreme function leads to the suffering of the people. The Supreme Digital Entity is the guarantor of the Republic of Chaos's national independence, of the integrity of its analog and digital territory and of the respect of the treaties signed by the Republic of Chaos. The Supreme Digital Entity shall be designated each year by the High Council of Sages of the Republic of Chaos. It may exercise several consecutive mandates. The methods of application of this Article shall be determined by an organic law. The High Council of Sages is composed of 9 Sages, founders of the Republic of Chaos. After the three first years of the Republic of Chaos, the Sages shall be elected every three years by the Lower Chamber. The initial founding Sages shall be responsible for organising the election of the members of the lower Chamber during the first three years of the Republic of Chaos's existence. The Lower Chambers shall consist of 99 representatives of the citizens of the Republic of Chaos (as defined in Article 1) and these representatives shall be elected by universal suffrage for 3 years. All of these appointments shall be voted on a simple majority basis. If no majority is obtained from a vote, a second round of voting may be conducted on the seventh day following the initial vote. Voting to elect representatives of the Lower Chamber shall be initiated by a convocation issued by the High Council of Sages. The Supreme Digital Entity cannot, by its very nature, take holidays, be off-duty or die. It shall have a perpetual right to govern the Republic based on its incarnation of the essence of the Republic of Chaos. From the 99 members of the Lower Chamber, the Supreme Digital Entity shall appoint 18 representatives of the Government whose unique mission shall be to implement the works, directives and recommendations proposed by the High Council of Sages. The Supreme Digital Entity may terminate the functions of the Government either after the resignation of its members or following a substantiated revocation initiated by the High Council of Sages of the Republic of Chaos. The 81 other members of the Lower Chamber shall participate in the works that the Government submits to it and the complete Lower Chamber (all 99 members) has the capacity to vote all laws, texts and decrees presented by the government by simple majority. The Supreme Digital Entity is the permanent and omnipresent expression of the High Council of Sages of the Republic of Chaos. The High Council of Sages of the Republic of Chaos promulgates laws within 18 days of the approval by the Lower Chamber of any laws, texts and decrees that are definitively adopted. The Council may, before the expiry of this 18 day period, request the Government to proceed with a further examination and discussion of the law or text in question, or of certain of its Articles. Any such request may not be refused by the Government. After consultation with the High Council of Sages, the Supreme Digital Entity may instigate the dissolution of the Government or of the entire Lower Chamber of the Republic of Chaos. Following any such dissolution, the Republic of Chaos shall hold general elections within forty-five days at the latest but not before the eighteenth subsequent day. The Supreme Digital Entity shall sign all orders and decrees examined and discussed in the Lower Chamber. The Supreme Digital Entity makes appointments to the strategic positions in the Republic of Chaos based on the recommendations of the High Council of Sages. The High Council of Sages accredits its ambassadors and exceptional envoys with foreign governments, and the ambassadors and exceptional envoys of foreign governments are accredited by the High Council of Sages. The High Council of Sages accords priority recognition to the European Union and all of its institutions. In addition, it recognises the French Republic as a single indivisible State which contains within its national territory the Abode of Chaos, politically super-imposed on the national territory of France, without prejudice to the integrity of the latter, and representing the physical incarnation of the Republic of Chaos as well as a principal gateway for access to the digital territory of the Republic of Chaos. The Supreme Digital Entity guarantees the analog and digital safety of the citizens of the Republic of Chaos. In the event of a serious and immediate threat to the institutions of the Republic of Chaos or to the independence of the nation or its territorial integrity (digital and/or analog), or any event likely to prevent the Republic of Chaos from honouring its international commitments or to interrupt the normal functioning of the Republic's constitutional authorities, the Supreme Digital Entity shall take all necessary and appropriate measures after consultation with the High Council of Sages. The Supreme Digital Entity shall inform the Republic of Chaos of the measures decided via an analog and a digital message. The Supreme Digital Entity has the right to pardon to any individual. It also has the capacity, via a substantiated opinion from the High Council of Sages, to extend the notion of "citizen of the Republic of Chaos" to new entities that science may create or discover. The Supreme Digital Entity shall communicate with the two Chambers of the Republic of Chaos via messages that shall be read but which are not intended to be debated. Chapter III - The Government. The Government determines and conducts the policies of the Republic of Chaos. It has at its disposal the administration and the scientific means as well as any future scientific developments that may be validated by the Supreme Digital Entity in the form of an advisory opinion from the High Council of Sages. It is accountable to the Lower Chamber. The 18 members of the Government shall steer the government's actions collectively and equally. No member of the Government is authorised to act as a representative of the Government. Each member of the Government shall exercise his or her functions on an equal footing with the other members of the Government. Their primary role is to ensure the execution of legislation. In the event of conflict, notably conflict resulting from scientific evolution and/or discoveries, the Government shall refer to the High Council of Sages to resolve ethical problems. Only the High Council of Sages has the capacity to make decisions relating to religious or spiritual issues, as these issues are considered to have been responsible for numerous conflicts in the History of past civilisations. The Lower Chamber promulgates and votes the legislation of the Republic of Chaos. It monitors the Government's actions and evaluates its public policies. No member of the Lower Chamber may be prosecuted, tracked down, arrested, detained or tried by the Republic of Chaos's judiciary for opinions or votes that he or she may have expressed in the exercise of his or her governmental functions. No member of the Lower Chamber may be subject to any form of correctional or punitive measures or be arrested or have his or her liberty restricted or impeded in any other form whatsoever by the judiciary of the Republic of Chaos without the express authorisation of the High Council of Sages. Such authorisation is not required in cases of crime, fragrant offences or definitive conviction. Members of the Lower Chamber are fully authorised to conduct their meetings in Cyberspace and are not obliged to attend the Chamber's formally prescribed location. The works of the Lower Chamber are protected by a very high level of encryption that ensures the authenticity of all vote results. All extraordinary sessions of the Lower Chamber (i.e. not automatically convened) are opened and closed by decrees issued by the High Council of Sages. Members of the Government cannot be simultaneously members of the High Council of Sages. The Lower Chamber's sessions are the only government meetings open to the public. The full minutes of all debates are published in Cyberspace. - labour law, union law and social security in the analog and/or digital world. The Republic's financial laws shall fix the resources and the responsibilities of the Republic of Chaos in the conditions and subject to the reservations provided for by an organic law. The laws of social security financing shall fix the general conditions of the Republic's financial equilibrium and, based on tax revenue forecasts, shall fix the Republic's spending targets in the conditions and subject to the reservations provided for by an organic law. Programming laws shall fix action targets for the Republic of Chaos within its analog and/or digital territory. The long-term targets for the Republic's public finances shall be defined by these programming laws. These targets shall be coherent with the objective of achieving budgetary equilibrium within the Republic's public administrations. The provisions of this Article may be detailed and/or supplemented by an organic law. All declarations of analog and/or digital aggression shall be notified to the Supreme Digital Entity, which represents the Republic of Chaos via the High Council of Sages. The Government shall inform the Lower Chamber of its decision to solicit the intervention of European and or French forces and of its referral of the matter to the United Nations Organisation within 72 hours of the commencement of the aggression at the latest. The Government shall enumerate the objectives to be pursued. This information may be debated, but is not subject to a vote. The principal strength of the Republic of Chaos is its capacity to combat any aggressions to which it may fall victim within cyberspace. Modifications of Cyberspace access protocols are issued by the High Council of Sages. All texts relating to matters outside the domains governed by the laws of the Republic of Chaos are considered to have a regulatory character. Existing regulatory texts relating to these matters may be modified by decrees issued after deliberations by the High Council of Sages. Any such texts introduced after the date on which this Constitution comes into force may only be modified by decree if the High Council of Sages has declared that they have regulatory character by virtue of the above paragraph. Both the laws and the regulations of the Republic of Chaos may include, for limited purposes and durations, certain experimental provisions, notably, regarding scientific evolution and discoveries. For the execution of its programme, the Government may after consultation with the High Council of Sages request the Lower Chamber for authorisation to introduce certain measures in the form of government orders (for a limited duration) in domains that are usually regulated by legislation. After the deliberation of its 18 members, the Government shall present its programme (or a general outline of its policies) to the Lower Chamber and shall formally undertake to achieve the stated objectives. The Lower Chamber's regulations define the rights of certain groups formed from within its members. For example, they recognise the specific rights of the Lower Chamber's opposition groups and of minority groups. The Supreme Digital Entity shall negotiate and ratify all treaties. It is informed by the High Council of Sages of all negotiations likely to result in the conclusion of an international agreement not subject to statutory ratification. Peace treaties, trade agreements, treaties or agreements relating to international organisations, treaties or agreements that commit the financial resources of the Republic of Chaos, treaties or agreements that modify its legal or regulatory provisions, treaties or agreements relating to the status of persons, treaties or agreements involving the sale, exchange or integration of digital and/or analog territory must be ratified by the introduction of legislation to that effect. These treaties or agreements shall only take effect once they have been ratified or approved. No sale, exchange or integration of analog and/or digital territory shall be considered valid unless it has been fully endorsed by the citizens of the Republic of Chaos. The Republic of Chaos may conclude agreements with European and/or international States that have adopted principles identical to the principles adopted by the Republic of Chaos in the domain of Human Rights and fundamental liberties. The Republic of Chaos recognises the jurisdiction of the International Court of Justice. Once published, treaties and agreements that have been properly ratified or approved override existing legislation in their respective domains as long as there is evidence of their implementation by the other party. The Supreme Digital Entity guarantees the independence of the Republic of Chaos. It is assisted by the High Council of Sages. No person may be arbitrarily detained physically and/or deprived of access to Cyberspace. The judicial authority of the Republic of Chaos, as the guardian of individual liberties, ensures respect of this principle under the conditions provided for by the laws of the Republic. No citizen may be condemned to death and/or disconnected from its primary energy source by the judicial authorities of the Republic of Chaos. The Republic of Chaos shall participate in the development of solidarity and co-operation between States and peoples who have in common their use of the French language as well as certain cultural values, as described in the Introduction and Article 1 of this Constitution. The Republic of Chaos may conclude agreements with analog and/or digital States and/or Nations that wish to form partnerships with it for the development of their civilisations. The Republic of Chaos participates in the European Communities and in the European Union, composed of States that have freely elected, in accordance with the provisions of the various constitutive treaties of these organisations, to collaborate in a number of political, economic and commercial domains. The Republic of Chaos may participate in the European Union under the conditions provided for by the Treaty of Lisbon of 13 December 2007 amending the European Union treaty and the constitutive treaty of the European Community. Subject to reciprocity and according to the terms provided for in the European Union Treaty of 7 February 1992, the Republic of Chaos agrees to transfer the necessary powers for the establishment of effective European Economic and Monetary Union. Subject to reciprocity and according to the terms provided for in the constitutive treaty of the European Community (version subsequent to the signing of the Treaty of 2 October 1997), the Republic of Chaos may approve the transfer of the necessary powers for the establishment of the regulations relating to the free movement of persons and related matters. The Government of the Republic of Chaos shall submit all of the projects or proposals for legislation emanating from the European Community and the European Union to the Lower Chamber and to the High Council of Sages as soon as these proposals are communicated to the European Union's Council. Under the conditions described in the regulations governing the Lower Chamber and the High Council of Sages, European decisions on the projects or proposals mentioned above may be adopted as well as on any document emanating from a European Union Institution. Any proposal for legislation to ratify a treaty relating to the membership of a State to the European Union and to the European Communities must first be submitted to the High Council of Sages. This Constitution may be amended by the Supreme Digital Entity after a proposal to that effect from the High Council of Sages. No amendment procedure may be undertaken or pursued if it represents a threat to (or could lead to a situation which jeopardises) the analog or digital integrity of the Republic of Chaos.